Losing seats and gaining power. It reminds me of the 2010 General Election. The Lib Dems lost four seats whilst only holding one last week as the voters spectacularly said they weren’t enamoured with the party. Yet according to reports in the local rag (and lets be honest logic) they will form a rainbow coalition with Labour and the Independents to run Southend Council for the next twelve months. I wrote earlier this week that the voters had voted positively for Labour and UKIP and whilst the Tories lost seven seats, they still got the most votes across the town and therefore these parties would represent the views of the voters of Southend to the best degree. Still doing a deal involving these parties was always going to be problematic due to the clear ideological differences between the Tories and Labour and the inexperience and relative unknowns of the new UKIP councillors. I fully acknowledge this but felt it would sum up the views of the voters. So the Independents, Labour and the Lib Dems altogether. On paper it can clearly work but mathematically it gives them a majority of just one and this is where I have little faith. I don’t feel any Labour members nor Lib Dem members would walk away from their parties but the independents are meant to be just that – independent – and as such have a variety of different politics across their group. Keeping that band of twelve together without one of them deciding that enough is enough and they remove themselves from the group (like Dr. Vel did) will take some doing. A majority of one is precarious at the best of times but when it is a three-way coalition with one of the three being a band of independents with views across the political spectrum from socialist through liberal to right-wing Tories. If they stay together through the budget then huge kudos. The electoral maths were really not helpful and this might be the best option available. I honestly don’t know. If the three run the council well over the next year then it will be a huge fillip and will help them politically. For the Lib Dems they do not face up to the independents nor Labour in any obvious target seat in 2015, so if the council does good work then seats such as Blenheim Park, Prittlewell and maybe even St. Laurence will be back into play. For the independents and Labour, both parties play more in the east of the borough where they face up against the Tories in most places and UKIP in one of two. Good governance will help them and with Cllr. Ian Gilbert’s run to win a seat in Westminster as well. If this deal does go ahead as reported then Cllr. Woodley would become leader and the three parties (well two parties and one group) will have a year to pretty much make or break their political ambitions in Southend for the next few years. If they do well and stop the seawall, stop the closures of care homes as well as restoring paid staff to all libraries then I have little doubt they’ll be popular. If they are unable to find the money for the latter two then it will be tough. The UKIP leader feels that his party and councillors have been unjustly shutout of any potential coalition and they may have a point but that’s politics. Had UKIP had won one more seat (probably Victoria) then they would be in a much better position due to that bone that I bang one about – electoral maths. Had the Tories won Leigh from the Lib Dems then the same could be said. Still the maths and makeup of the chamber are what they are and UKIP could be shutout by this proposed coalition. I wonder if they regret their pact with the independent group now? Still here we are. It looks like the Tories are going to sit on the sidelines for a year and it is over to the Independents, Labour and the Lib Dems to show that they can run the town better than the Tories did. I hope that they can because if they don’t then it is very possible that UKIP will be the kingmakers next year and personally I would prefer this not to happen. Oh maths, electoral maths, it has been a while since we have met but the future of Southend is up for grabs and it is time to turn to you to work out what is feasible. The Tories went down big on Thursday night and unsurprisingly lost the majority in the Civic Centre. So the big question is now, ‘who will run Southend Council?’ and the realistic possibilities bring about a rather unlikely coalition. So the easiest answer is the Tories do a deal with the independent group. 31 seats. Simple. End of blog. But wait there are two issues at play here, John Lamb has already stated that he won’t work with ‘some independents’ and also that loose UKIP/Independent alliance that meant they didn’t challenge each other in any seat across Southend, does that alliance go as far as becoming a package deal in coalition talks? To answer that then the leaders would need to speak but both have hilariously denied there was any form of alliance and it just happened to be coincidence that they didn’t stand against each other, yeah and its a coincidence that women run away from me when I start talking about my care bear collection that live on the headboard of my bed, get real people. So lets for now say that a Tory/Indy deal is problematic. Next up is the juicy one and if we are being 100% non-partisan then what would make the most sense for the people of Southend – a Tory/Labour coalition. This results in 28 seats of the 51 and would provide the stability that Southend needs at this point when budget squeezes are making budgets harder and harder to put together. Of course there is one huge problem and that is Labour would not want to go into coalition with the Tories politically nor philosophically. I suspect the Tories would do the deal as they are rather pragmatic and know that a two party coalition is more likely to hold together than any potential three-way. Labour though would have to stop throwing rocks at the council and would have to deal with the real issues of power and taking the tough decisions is a difficult climate for local councils, are they ready for that? The local rag on the front page yesterday said that an Independent, Labour and Lib Dem three-way was the most likely outcome. That would be tough to do. I firmly believe that the voters of Southend spectacularly rejected the Liberal Democrats last Thursday and therefore they should not be part of any ruling coalition on principle unless there really was no alternative. Also Labour have been more vitriolic towards the Lib Dems than any other party and working with them would be at best an uneasy truce and I’m not sure the Lib Dem five would back Ron Woodley as leader of any coalition considering we’ve abstained on this issue before (note to Lib Dem councillors – abstaining is weak). I think the Lib Dems are out of this and this of course depends on whether this Indy/UKIP alliance goes forward beyond last Thursday. If it does then an Independent, Labour, UKIP coalition would achieve the same goal mathematically. We can pretty much take it as fact that the Independent group would work with UKIP and those parties could gain control of the chamber if Labour follow them. The Tories and the Lib Dems do not have enough seats to form a deal on that front, even with Dr. Vel and would need in all likelihood the Thorpe three to go with them. It doesn’t seem practical and nor would it be right that the two parties that were rejected by the electorate form a coalition. There are only two coalitions that make sense mathematically and would seemingly form a cohesive group of councillors who could lead Southend and both involve the Labour party. One is a straight up coalition with the Tories and the second is a coalition with the Independent Group and UKIP. So it is time for the nine Labour councillors to decide whether they are prepared to put politics aside for the good of Southend or whether politics comes first. If they want a better Southend then it is time for them to step up and form one of these two coalitions. If they decide that they would rather sit on the side in opposition and throw rocks at whoever leads the council then it would be disappointing and disheartening, albeit not surprising that they put ideology and politics first and the betterment of the people of Southend second. I implore Cllr. Ian Gilbert and his team of councillors to do one of the two deals above. Swallow your pride and work with either the Tories or the Indy/UKIP alliance and put Southend first. If you don’t then the door is wide open for the independent group and UKIP to gain enough to win an outright majority in 2015 and that is something that I personally would not like to see. So the past few days have been even more disappointing than my private life. I know you didn’t think it was possible but returning one councillor in Southend whilst the UKIP took five seats in the Civic Centre coupled with only one MEP showed that the countries (and Southend’s) appetite for Nick Clegg and the Liberal Democrats is not shall we say…on the rise. However this isn’t the time to panic and nor is it the time to either change our leader or run away from the coalition. This is the time for us to not look at ourselves or our policies, but to look at how we can get people to both listen to us to believe in us once again. Let me tell a story about my family. I was brought up in an Anti-Tory home. I was brought up to believe that they were the political devil. I suspect I wasn’t alone in this regard. Therefore the voting record in our household was quite simply vote for whoever had the best chance to beat the Tory. The sad fact though is that as a young person we only ever lived in an area with a safe Tory MP. In 1997 though Dr. Peter Brand won the Isle of Wight for the Lib Dems, sadly he was not a good constituency MP and he would lose in 2001 and ever since my local MP has been of the blue persuasion. I knew of my brothers and younger of my two elder sisters political beliefs (both LD) and my mum was always left leaning but would vote on the Anti-Tory ticket. The one person I didn’t know about was my eldest sister. Well we spoke about this last night and I think she is a fantastic example of the type of person that we need to be speaking to as a party. She votes on the Anti-Tory ticket, where she lives that means Lib Dem. She was very angry with Nick Clegg for going into coalition with the Tories and wasn’t sure if she could bring herself to vote for his party again. On Thursday she voted Liberal Democrat. She came to the conclusion that in 2010 the Lib Dems really didn’t have much choice but to go into coalition. The electoral maths didn’t add up for a Lib/Lab coalition and to get any form of left-sided coalition to work, it would need the help of all the minor parties and that realistically that wasn’t feasible. She also decided that she preferred the Lib Dems to be curbing the right-wing of the Tory party instead of letting them run wild. She can see the economy picking up and business at her place of employment doing ok. So whilst she was angry that Nick Clegg and the Lib Dems helped keep the Tories in power, she could see that the only other option was for a second General Election where the Tories would have likely won a majority and that was a worse idea in her mind. My eldest sister isn’t what you’d call overtly political but she reads the newspaper and watches the news, she’d what you’d probably call the average voter, unlike me who reads political blogs, watches political TV all the time etc. and yet she could see that given the options – having the Lib Dems in a coalition was the best way forward given the alternatives. My sister is exactly the type of person that whilst angry, could still be receptive to the party. She has no problems with EU nationals working in her place of employment. She can see the benefits of freedom of movement and trade across the EU, she probably isn’t what you’d call a passionate European but thinks that the pros outweigh the cons. She is someone who is essentially an Anti-Tory but who can understand that the real world sometimes beats out ideology and when it does, you go for the best option available. There is no doubt that she would have preferred a Lib/Lab coalition, as would have I but sadly the maths didn’t allow that to happen. I suspect had Gordon Brown not called Gillian Duffy a bigot that the maths would probably have allowed that coalition to form. Alas we shall never know. Plenty of people are angry and I won’t lie when I say plenty will just not listen any more. However many still will and many will begrudgingly acknowledge that what happened in 2010 was the best option available. They may not have liked it but when given the realistic options available then they start to understand why it happened and that the Lib Dems didn’t just sell their soul for ministerial cars as the lazy rhetoric dictates. As a party and as activists we need to decide whether to embrace what the national party are doing or not. In some areas of the country activists seem embarrassed by the national party and in others they are proud of the rise in the tax threshold, the pupil premium, the triple lock in pensions etc. – it just seems there is no cohesive strategy and that it is left to local parties, who are often split themselves on the coalition and how to handle it to decide how to campaign. This seems like a mistake and doesn’t lead to a clear vision of what the Lib Dems stand for. Until we decide on what our clear vision is and everyone is on board I fear that what we say won’t get through. However I definitely feel that once everyone is on board and sings from the same hymn sheet then people will listen. Well that isn’t a blog post title I ever expected to write. Every so often I get Press Releases via the blog. In recent weeks I have started to get quite a lot. I usually scan read them and then do nothing with them. I’m quite busy at the moment working on two large projects outside of work, firstly the locals elections and secondly my weight. When you are working out for two hours a day then your free time suddenly dissipates rather quickly. So anyway I got a Press Release this afternoon entitled, ‘DC Lobbyist Boycott of Visa, Rams after Michael Sam drafted‘ and my eyes focused sharply. For those who don’t know who Michael Sam is, in short he was a very good college football player in the States who came out as gay earlier this year. He finished college and was eligible for the NFL draft. He was a fringe prospect and no-one knew if he would get selected but with just seven picks left in the draft the St. Louis Rams drafted him and he is the first openly gay player in the NFL. He celebrated getting drafted by kissing his boyfriend live on national TV. It was a deeply important cultural moment. Now my e-mail thought it was a scam so I did some googling and you know what, it wasn’t and it isn’t. In February he was widely reported to be working on this bill and with Michael Sam getting drafted he is trying to generate publicity again. Michael Sam signed an endorsement deal with Visa and the lobbyist believes that people should boycott the company for being associated with a gay athlete. First of all learn how to spell fibre American people – if you are going to pretend you use the English language then at least learn how to spell it correctly. Secondly and probably more importantly – what the hell is this man on? I was brought up in a Christian household and I am pretty sure that Christian’s are taught to be a tolerant people. When I read garbage like this then I just shake my head and wonder if there really was a God then how would he (or she or it) like seeing people being persecuted in his/her/its name? Section 1. The National Football League, Major League Baseball, the National Basketball Association and the National Hockey League and all teams thereof shall hereby be prohibited from employing players who are homosexual. This provision shall apply only in cases where a player has openly declared himself to be a homosexual. So yes, if you are secretly gay then that is fine but anyone who is open about their sexuality should be blocked from earning a living in any of the listed professional sports leagues. This is in his opinion to stop young people growing up and seeing and hearing about practicing homosexuals in professional sports. What rock did this buffoon crawl from? Young people should be taught to treat everyone as the same. If God does exist then he/she/it created us all and that includes gay people. I’m pretty positive that if this is the case then gay people weren’t created to give non gay people a group of people to persecute. Young people being exposed to gay people doesn’t damage the moral fibre of society, anyone who thinks that this is the case is a grade A moron. The sooner that the likes of Jack Burkman are castigated for their points of view then the better society as a whole will be. Jack Burkman is no way shape or form speaks for the Christian community and believing that he does is nearly as galling as what he says. Michael Sam coming out and having to bare the brunt of this type of homophobic abuse is courageous is the extreme. I hope he will be a trendsetter and I am sure that the United States of America as a whole will support him. Sadly there are not so insignificant pockets who won’t and by all means we aren’t exactly the most tolerant society over here in the UK but I’m not sure the public as a whole would have any stomach for banning gay people from any form of life. I just felt that I had to write something about it as I couldn’t stomach the fact that the Press Release got sent to me. I hope that his efforts go unrewarded and I have no doubt that even if he got enough sponsors to get the bill debated that it would never gain the traction or support it would need to get passed into law but it makes me deflated that people still think persecuting fellow human beings in the name of Christianity is acceptable behavior. However this isn’t an advert for his apartment, I wanted to point out one of the photos used to try and attract people to buy the property. There are three external shots and two of our courtyard. One of them is embedded below. Well the thing is the angle is very clever as the photographer uses the plant in the bottom right hand corner of the photo to completely obscure my patio. My poor neglected patio with empty pots and soil over the stones after I pulled out all the weeds the other day. Other neighbours have always told me that my patio dragged down the value of properties and even the good people at Dedman Gray agree but ensuring it wasn’t seen in this photo. It just made me smirk. It is genuinely a very nice apartment and would make a good home for someone. 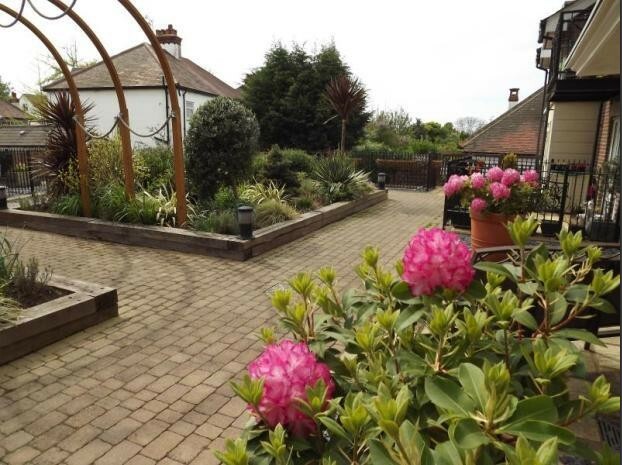 It is a lovely area with a railway station and The Broadway on your doorstep. However if someone having soil and empty pots on a patio is going to put you off then maybe it isn’t the best place for you. Appearances are important not just in dating and interviews but seemingly in everything.